It’s May, and we have a special treat lined up for our monthly mixer. Join us May 19 for our networking event at WorkPlay in Lakeview [map]. We’ll be there from 5:30 and 7:30. Anyone in media, advertising, PR and Web should stop by — please tell your colleagues, friends and enemies to join us. Complete details are available on the Evite. 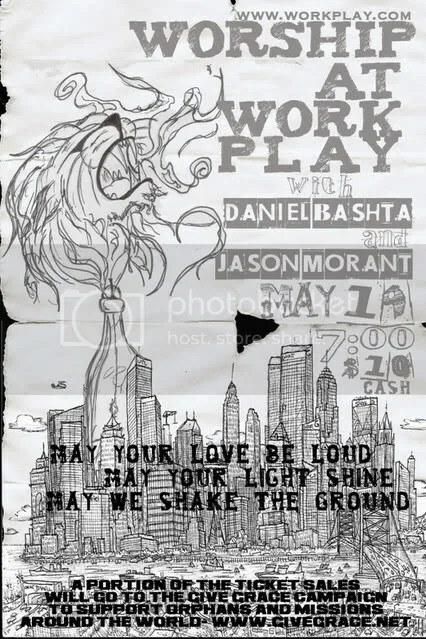 Plus: Stick around for a $10 fund-raiser concert featuring Daniel Bashta and Jason Morant. A portion of the proceeds goes to Give Grace, an Auburn-based charity supporting orphans and missions around the world. Show begins at 7. Questions? Contact us or leave a comment. P.S. Please join our free mailing list for all the updates straight to your In box. This entry was posted in Our events and tagged advertising, Birmingham, Daniel Bashta, Give Grace, Jason Morant, journalism, lakeview, may2008, Media of Birmingham, MOB, networking, new media, public relations, workplay. Bookmark the permalink.